Slow fashion is ... well ... slow. Unlike the fast fashion industry, which offers virtually everything we could imagine wanting (and more) at any given time, slow fashion does just the opposite. Rather than pushing out 52 "micro-seasons" a year, mass producing cheap clothes that are designed to fall apart — a rather wasteful approach both financially and environmentally speaking — slow fashion brands typically focus on just two seasons a year, creating quality, long-lasting products on a made-to-order basis. What does this mean for us as consumers of slow fashion? For starters, it means that we don't have to feel pressured to keep up with the weekly " fashion trends." It means we actually have to stop and think about our purchases. And most importantly, it means we have to learn patience. Slow fashion teaches us to be patient with our money — to spend weeks, even months saving up for that investment piece we fell head over heels in love with and just can't live without. It teaches us to be patient with our closet — to closely examine what we already own and determine what we're still lacking. It teaches us to be patient with our time — to wait weeks or months for an item to arrive after it's been ordered. It teaches us to be patient with our impulses — to overcome the urge for instant gratification and hold out for what we really want in the long run. And this philosophy is not just limited to the fashion world. As daily life continues to move at an ever-increasing speed, we tend to find ourselves searching for faster, cheaper, more convenient ways to get what we need, and as a result, we've forgotten about the process that goes into making those things. And while I certainly wouldn't expect anyone to purchase all of their goods this way (believe me, I still rely on Amazon and Target when that's the most practical option), I think it's a good way to teach yourself discipline and truly appreciate the things you surround yourself with. One such example is the Rai Jumpsuit from Two Fold Clothing. While checking out the SS18 Collection back in April, I was immediately drawn to this stunning piece. With lots of other expenses being put toward our move, I decided I would wait to invest in it until I had earned enough money from selling some clothes that weren't getting enough love on Poshmark. That alone was a little over a month-long process. I finally made the leap during the Travel Virtual Pop Up sale hosted by The Garment Life, because sales are few and far between when it comes to slow fashion. I had made a little over 75% of the cost at that point, so I decided to finally hit the "Add to Cart" button. Once the order was complete, it would be another month or so before this piece would arrive at my doorstep. Why? Because Morgan makes all of her lovely clothing herself (with the help of some sweet interns). Each piece is carefully crafted from start to finish under one roof, and that takes time. But you know what? The wait was absolutely worth it. 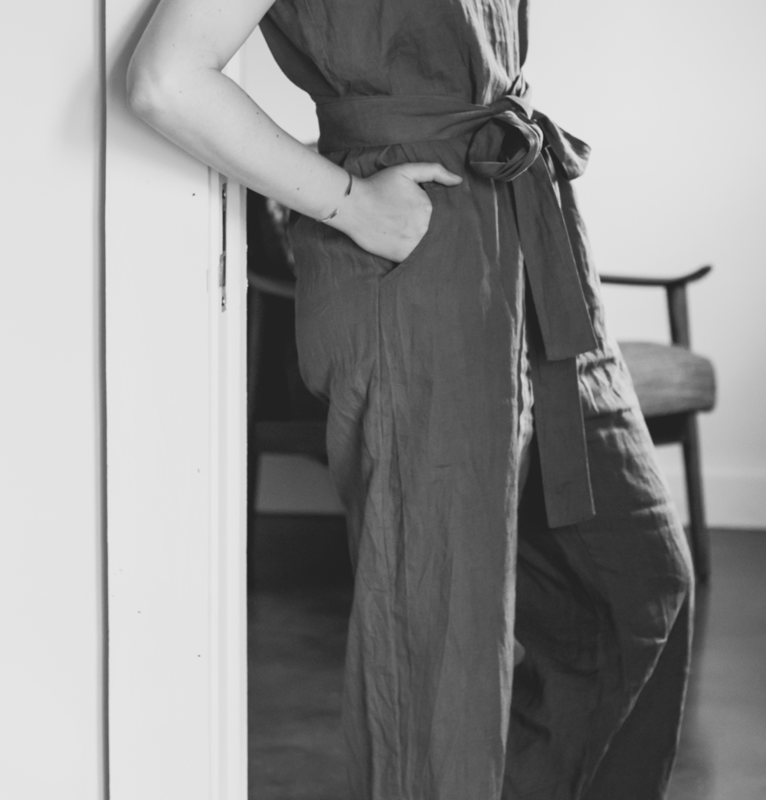 The Rai Jumpsuit is the epitome of what linen dreams are made of. Inspired by simple, no-fuss, minimal design, this piece is made to be easy to wear. It has a double v-neckline that allows it to easily slide on over the hips (something I've got plenty of), as well as pockets and a detachable belt that creates a more feminine silhouette when tied around the waist. WHAT LIFE LESSON HAS SLOW FASHION TAUGHT YOU? For transparency's sake, this post is not sponsored, nor does it contain affiliate links. It's simply an informational post featuring one of my favorite conscious clothing brands. Cheers!